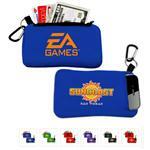 Promotional tech pouch and organizer - great for travel with all your tech cords or smaller items. Made of recyclable 80 GSM non-woven polypropylene. 2 zippered compartments to store your cords. 2-tone Heathered/black material with pen or stylus loop. Colors: Blue, Green, Gray, Orange, Red. A great tradeshow giveaway! Production Times Available: 5 to 7 working days. RUSH AVAIALBLE. 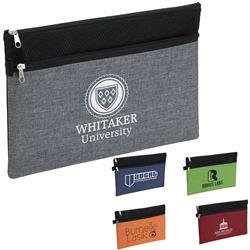 Dimensions: 9-3/4" x 7" x 1/4"
Typical Imprint Area(s): 6.5" x 3.5"
Dimensions: 23" x 13" x 14"